Kevin Winter/Getty ImagesFrances McDormand winning best actress at the 90th Academy Awards. 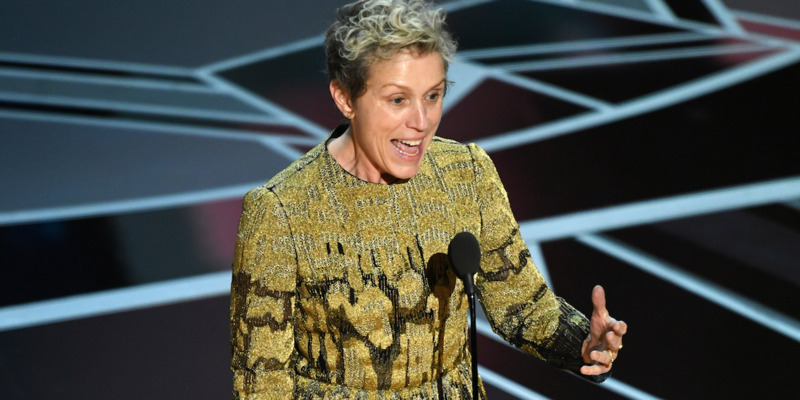 Frances McDormand mentioned an “inclusion rider” during her acceptance speech for best actress at Sunday’s Oscars. That means including a mandate in contracts for upcoming productions that guarantees race and gender diversity. Frances McDormand’s Oscar win on Sunday wasn’t a surprise, but something she said in her acceptance speech was. That’s a very inside baseball term, even for people in the entertainment business. McDormand was asking those with power in Hollywood to push for requirements in movie and TV contracts for race and gender diversity, with a specific clause or clauses that guarantee it. When McDormand asked every female nominee to stand in the auditorium during her speech, it was to drive home the point that these major players should now demand an inclusion rider when negotiating in the future. The Oscar evening was filled with female presenters and winners pointing out the rare diversity in this year’s awards – from Emma Stone saying “these four men and Greta Gerwig” when presenting the best director award, to the original song winners pointing out the 50/50 gender representation in their category. But McDormand’s, though more insider talk, is an extremely important power play when increasing the gender and race equality in Hollywood going forward.